Unveiled in 2013, China's Belt and Road Initiative is a massive stimulus for infrastructure development across over 60 countries. In this article, Hilary Lau, Monica Sun and Jie Li from our Greater China offices provide an overview of the initiative to date. What is Belt and Road? 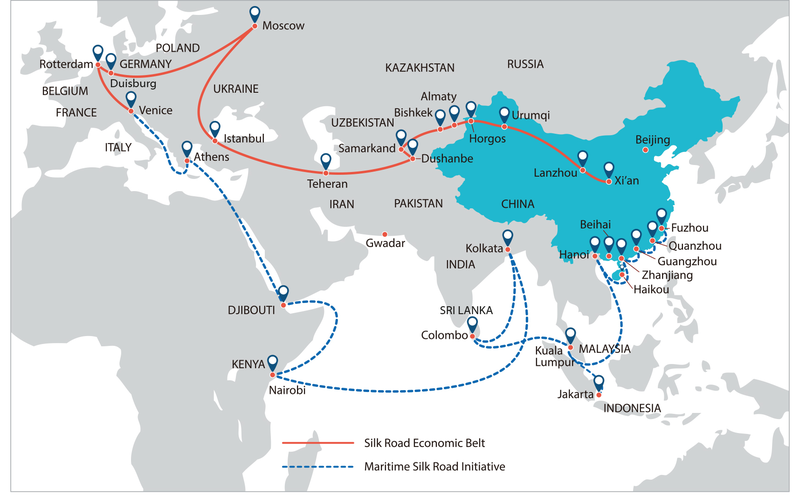 The Silk Road Economic Belt and the 21st-century Maritime Silk Road, also known as The Belt and Road, is a development strategy and framework, proposed by Chinese President Xi Jinping. It focuses on connectivity and cooperation among countries, primarily between China and the rest of Eurasia. It consists of two main components, the land-based "Silk Road Economic Belt" and oceangoing "Maritime Silk Road". Belt and Road can be thought of as an “umbrella” that catches outbound investments and development of infrastructure, such as roads, bridges, pipelines, ports, railways and power plants, in countries along the BRI. Chinese government statistics show that trade volume between China and the countries along the Belt and Road routes reached US$983 billion in the first 11 months of 2017, up 15.4% year on year. In addition, China signed four new free trade agreements last year, taking the total number of agreements to 16, benefiting 24 countries and regions. large financial institutions, including Asia Infrastructure Investment Bank, the New Development Bank and Asian Development Bank. By the end of 2016, CDB and CEXIM had provided US$200 billion in loans to Belt and Road projects. The three biggest state-owned banks – Industrial and Commercial Bank of China, Bank of China and China Construction Bank – had provided a total of US$225.4 billion in funding. State-owned investment fund Silk Road Fund was launched at the end of 2014 to foster investment in the Belt and Road. It is funded by China's State Administration of Foreign Exchange, China Investment Corporation, CDB and CEXIM with a total capital of US$40 billion. As of March 2017, Silk Road Fund had invested US$6 billion via equity and loans in more than 15 projects, including the Yamal LNG project in Russia (on which Herbert Smith Freehills advised Silk Road Fund). New Development Bank, are also major Belt and Road financiers. Many Chinese SOEs that are the traditional EPC contractors for energy and infrastructure projects are now also taking an equity interest in the projects, as project sponsors. The funding for these projects is supported by the Chinese policy banks, SOE banks and other Chinese financial institutions identified above. China Civil Engineering Construction Corporation’s upgrade of the railway system in Belgrade, the capital of Serbia. China has taken various measures to tighten its control of capital outflows since the end of 2016, including increased regulatory scrutiny of outbound M&A deals and significant foreign exchange transactions. While this has created uncertainties and challenges for some outbound investments, Belt and Road-related projects seem unaffected by such measures. In August 2017, NDRC, MFA, MOFCOM and People's Bank of China jointly issued a clarification on outbound investment related to Belt and Road projects. In that clarification, infrastructure investment and construction in countries along the Belt and Road are expressly specified as “encouraged” projects, which are not subject to the tightened controls. As with most outbound investments, country and project risks are still the major concerns for Chinese investors in Belt and Road projects. As Chinese construction companies, other SOEs and financial institutions evolve from traditional “pure” EPC contractors to project sponsors, there is a concern that country and project specific risks may be underestimated. The commercial driver for many of these projects is often the EPC aspect - that is, the ability of Chinese SOEs to provide the EPC component of the project, rather than the overall return on investment for the project. However, the Chinese construction SOE tends to take a minority equity stake in the project alongside acting as an EPC contractor. This ensures control over the EPC aspects with minimum capital risk in the project. As many of these projects are greenfield projects, a longer lead time will usually be required for legal matters such as due diligence, structuring the project or transaction and government consents. Therefore, it is important to allow for sufficient time to complete these legal matters. Many Chinese SOEs have already learned this lesson – especially the time needed to deal with local authorities and partners. Project finance is widely used in international energy and infrastructure projects. For many Chinese banks, this is still a relatively new concept and they are more accustomed to simple financing structures. However, in the near future there will be more roles for non-Chinese banks to play in these projects (including for project financing). The Chinese banks' appetite for project financing Belt and Road projects remains to be seen. There is no official list of Belt and Road projects, participants or countries, making it hard for investors to identify these projects. However, many projects are being driven by the participants, especially the Chinese development banks. For those investors interested in Belt and Road projects, we recommend regular communication with these participants to ensure you are up to date on potential opportunities to participate in these projects. Belt and Road is one of the most significant global infrastructure initiatives of recent times. However, many of its projects are still at an early stage, and so many key questions around precisely how it will work, and which projects it will include, remain unanswered. Where governmental agreements or trade treaties exist for Belt and Road, home government bodies can also assist international companies to build relationships. Hilary is a corporate and commercial lawyer specialising in the energy and natural resources sector. Monica is a partner in our corporate group.